with inside tips & commentary by The Professor, Peter Beames. What type of course is goat hill park? We're not an executive course... not a regulation course... we're a hybrid that is commonly referred to as a "Short Course" Par 65. Walk: If you're looking for exercise, it's a great workout to walk. A lot of locals walk religiously, using a light carry bag and an abbreviated set of clubs. Try taking 7 to 12 clubs to lighten the load but also to work on hitting different types of creative shots. Ride: It's a challenging walk so carts are available, especially for beer drinking, fun loving, folks looking for a getaway from the digital world & to get some fresh air! However, we demand that you keep off all slopes, use caution and follow signs. Cart paths only on all par 3's, please. Slight dogleg right. Off the tee aim straight away. 200 yard tee shot will leave you less than 100 yards to the hole. Carts keep left of green for easy access to 2nd tee box. Plays up hill into the wind toward O'side local Junior Seau's foundation. Consider taking an extra club. Beginners advised to use the Mini-Goat tee box to avoid forced carry. Aim at the big dead tree with slight draw - hole on the left side of this double green. The forward green tee box is on the other side of the cart path. Carts use caution - go slow downhill. A long drive here can get you into trouble. 200-210 yards is all you'll need to leave around a 110 yard shot into the green. Generous fairway but left center is best angle to green. Favor left side, right of green is no good. On a clear day you can see Palomar Mountain behind the green. 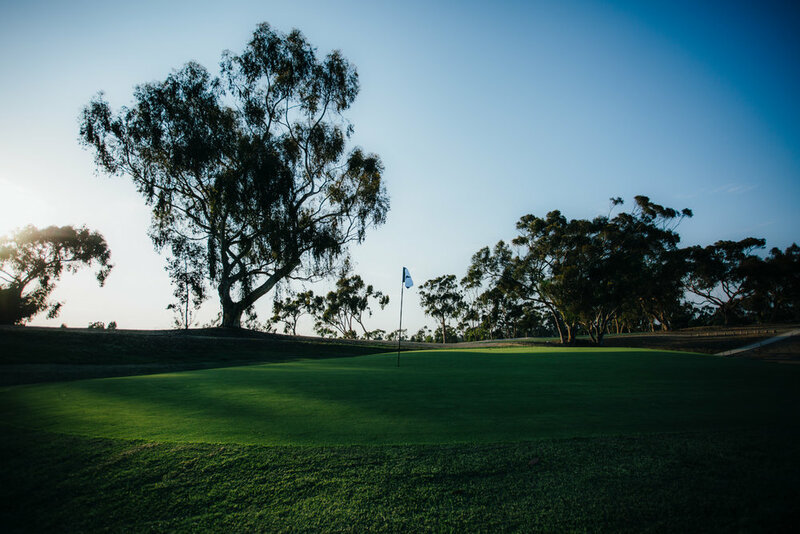 Look to the right from the tee box and check the pin placements on green 6 and 14, enjoy the ocean view. Plays uphill, favor the right side of the green. Left is no good here. Ball will come down off the sloped bank on back of green. Consider an extra club. Take dead aim and be glad you're not in the grid-lock on the 5 Freeway. Lance will say the hum of the freeway resembles the melodic sounds of the ocean... it works. Aim over the green/white aiming post. MAKE SURE the group in front is up by the green before you hit your tee shot. Shared green here so aim at the pin on the right. Our shortest hole which plays slightly down hill. Finish the front strong then grab a snack and beverage at the turn. Enjoy! Downhill. Avoid bunkers on the left - best to aim left center as the ball kicks right. The shot to the green is tricky...a grass bunker and a long narrow green makes it tough to judge distance... don't go long. Plays uphill and usually into wind. Look right on way to green for sneak peak of 12. 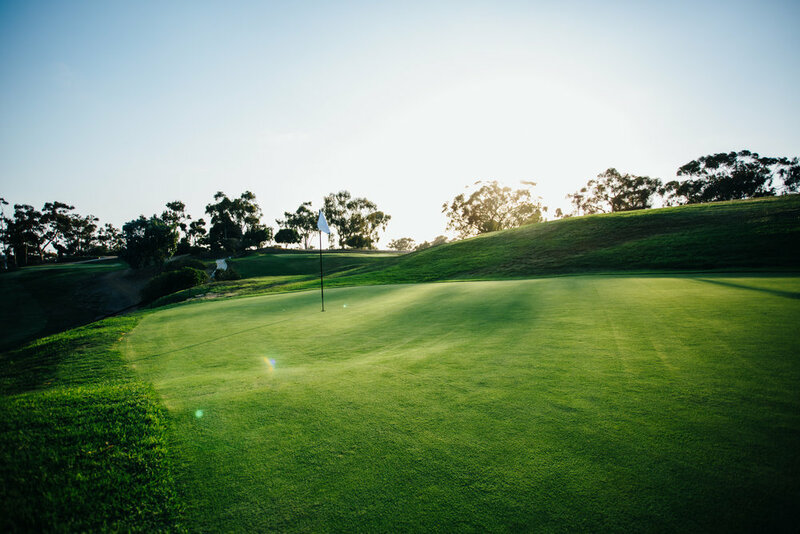 If in cart - while by the green, bring your 220 yard club for tee shot on 12 (to save a trip back to the cart). Dogleg left - It's 225 yards to the aiming post in the fairway. The second shot plays uphill to a very small, two tiered green. Favor the right side, anything left of the path should get a nice kick onto or close to the green. Left of the green is no good. Not a long hole but keeping it straight is a priority. Plays up hill. Take your time reading the putt...can break a little more than it looks. 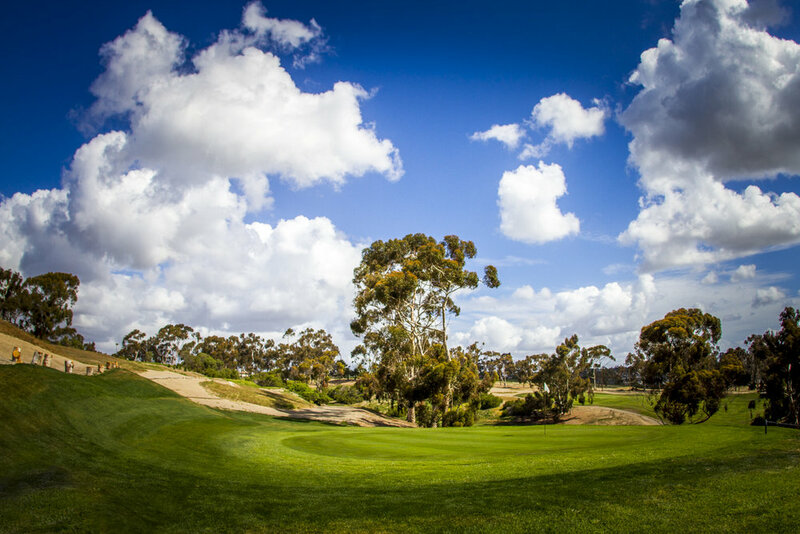 Somewhat blind tee shot, the hole is a dogleg right but keep drive left of the Eucalyptus trees on right. The green is to the right of the pepper trees with a bunker in the front of the green. A slightly blind tee shot that is downhill. The ball should roll out and the hole is dead straight. Keep it between the tree lines or else not good. The second shot plays uphill. This plays downhill usually helping wind. Favor left side of the green. Ball below the hole here for an uphill putt is an advantage. Straight away - 200 to 220 yards off the tee is a good play will leave 100 yards left. Finish Strong! Grab a cold one and add 'em up. Thanks for coming out - see you soon!